He told talkSPORT: “When he was on the floor on top of me he went a bit limp and I thought ‘he doesn’t want to get up here’, I thought he’d at least try to get up. “The next thing I felt was his teeth sink in and I didn’t know what to do, really, it all happened quickly. It was just a bit of a mad experience. “When I stood up and first went over to him, part of me wanted to just lay him out there and then. “I thought better of it because it would have got myself in a load of trouble and it would have caused a lot of trouble on the night. “I don’t know whether it’s out of character for him or not because I’ve sparred with him quite a bit and I’ve always found him to be pretty respectful. 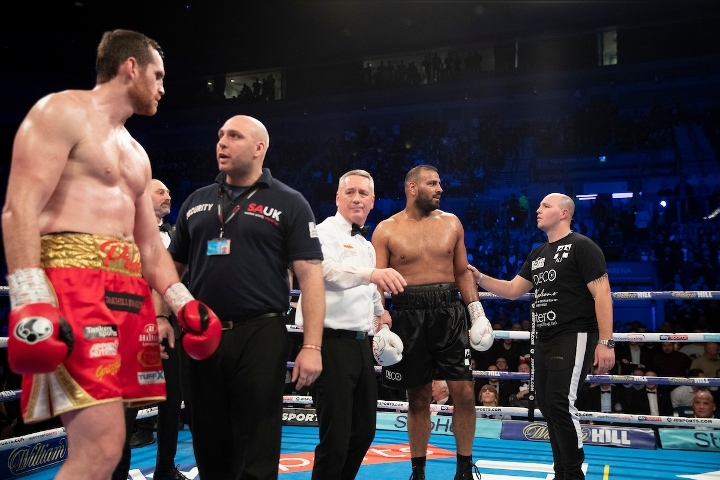 Ali – who has also had his purse, estimated to be in the region of £20,000, withheld, minus expenses – admitted to iFL TV shortly after the fight that he had been “stupid” and he could now face a lengthy ban. Price, though, added: “In all honesty I don’t think Kash Ali’s career is going to really go that far anyway as far as getting places is concerned. “It will just stop him fighting for a while. He was going to go back to fighting on the small hall bills which is what I said anyway before it. “He’s just ruined it for himself. He was on the big stage, he would have got knocked out eventually but at least he would have gone out with his head held high because that’s boxing and that’s what happens in boxing. Can Povetkin Pull Off a Wembley Upset?